I attended a meeting last night in which a meal was served and because we have so many good cooks in the community, I was anxious to see what was being served and what I would be missing. When I saw that it was a delicious elk stew with green salad and baked bannock, I knew I would be missing a good meal and quickly tried to duck out of the way to let others get closer to the table. I said “Oh go ahead” to one of the men who was in attendance and he said “No thank you” and explained that he was waiting for everyone else to serve themselves first and he explained his cultural teaching that he was following. He said that because he was a warrior he would wait. They do not rush to fight nor do they rush to eat. With this teaching, I then decided to take a very small food offering with which, this morning before I had anything to eat or drink, I walked up the hill behind my home and said a prayer and laid out my wishes and intentions for this experience. Everyone deserves to live a life full of joy and purpose. I am quite certain that subsisting on the funds available for food while on income/social assistance creates a huge barrier to that fulfillment of joy and purpose. This picture shows the careful measuring and calculating that I am doing to ensure that my food lasts the whole week. Last week I was talking with my partner about the challenge and he said “Why don’t you just buy only foods you love and eat it all within the first two days then starve for the rest?” We laughed pretty good over that one and thought about the number of people we knew who might do that. Now that I think about it, I should probably drink all of my chocolate milk right now because as soon as my daughter sees it in the fridge she’s going to insist that she have it. I have actually often heard people comment that it can be hard to keep other people in your home from eating your food. This is a situation that can arise as a result of the over-crowded living situations on reserves if one potentially has a household member who as a result of addictions does not prioritize their money towards food yet still want to eat. Also, mothers raising children on social assistance will often go without so that their children can eat. 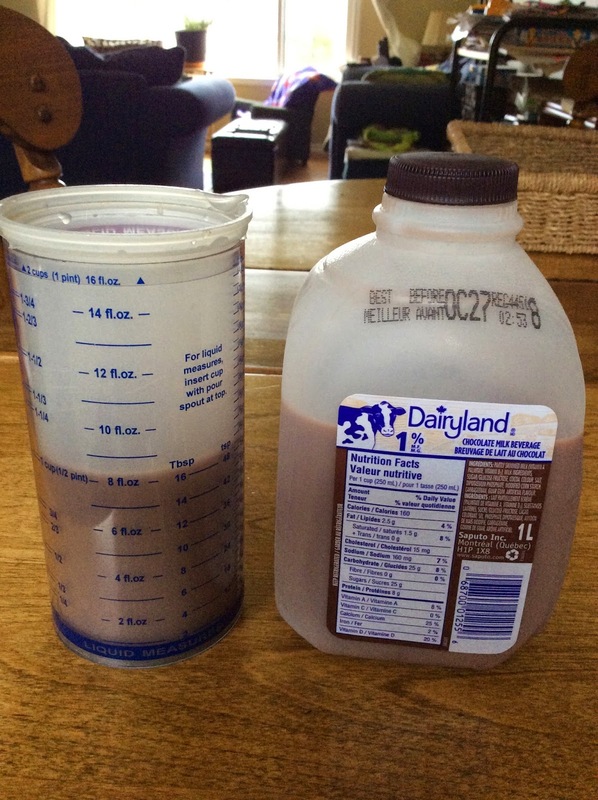 Chocolate milk: after passing on this for the first day, I will have 2 cups/day; This will meet my required number of servings from Canada’s Food Guide provided that my daughter doesn’t spot it. Noodles: 24 packages allows for a little more than 3 packages/day (If I eat all three portions of noodles I will make the minimum requirements). Beans & Peanut Butter: I am pretty confident that I will meet my 2 servings a day from the meat and alternatives group here. Cabbage: its going to offer 1-2 food guide servings per day. I won’t meet the recommendations here. Tea: 20 bags allows me almost three a day. NOT NEAR ENOUGH! I think I am suffering from caffeine withdrawal as I have had a headache for at least the past 24 hours. 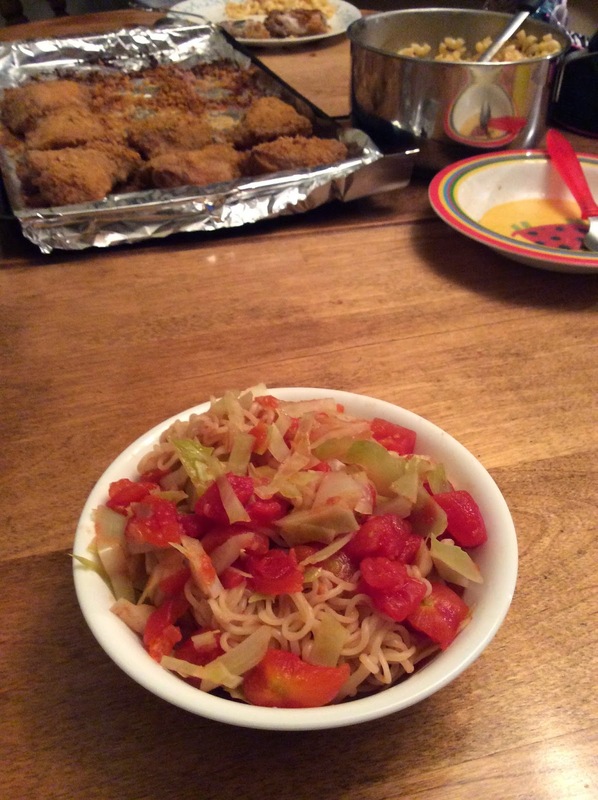 This delicious canned tomato, fried cabbage noodle dish that I had for dinner tonight totally reminded me of when my mom made me macaroni and canned tomatoes as kid. Totally loved it then and still do. Forgot about that simple comfort dish. Please note: my family is not participating in the challenge so they were having chicken and macaroni & cheese for this lovely Friday night dinner at home. Category: 2014 Day 2, 2014 Welfare Food Challenge, 2014 WFC Participant Blog Tags: Suzanne J.